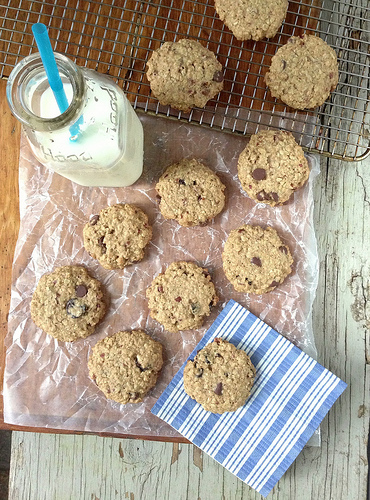 Traditional, butter-drenched chocolate chip cookies get a super-healthy makeover with these Cherry Chocolate Oatmeal Cookies. 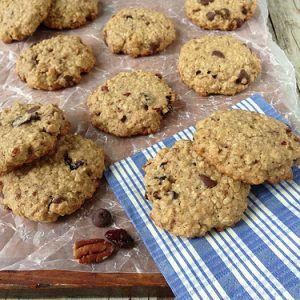 They’re made with dried tart cherries, oats, pecans, and other good-for-you ingredients and they pair up perfectly with a glass of low-fat milk! 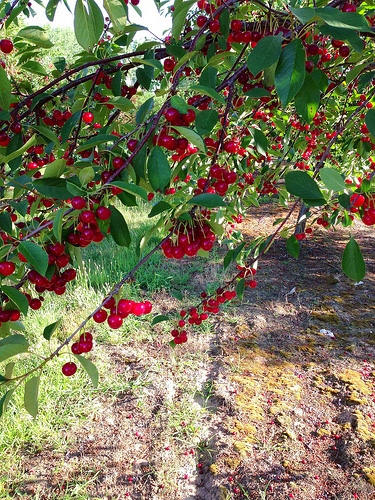 I recently returned from Traverse City, MI for the tart cherry harvest. I was invited by the Cherry Marketing Institute to join them for the Cherry Harvest in Northern Michigan. They paid for my travel, but all opinions on this blog are solely my own. 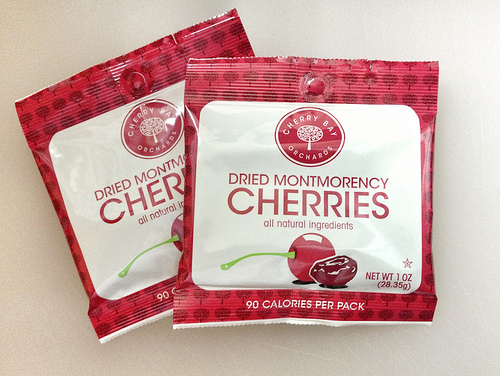 Everyone in the group was sent home with a bunch of goodies including dried Montmorency cherries. So I decided to use them in this new better-for-you cookie. 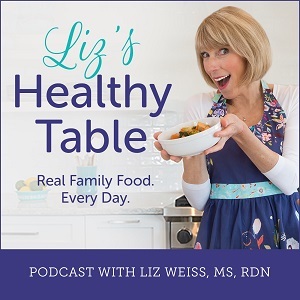 A half cup of dried tart cherries has 200 calories, 2 grams of fiber, and an impressive 45% vitamin A. Kids love cookies, but like any sweet treat, it's best to not go overboard. I'm happy to report that you can feel good about giving your kids these cookies. 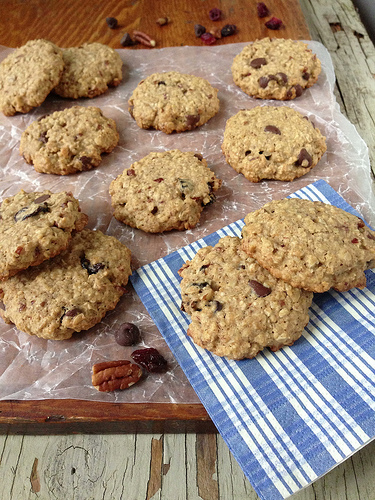 Made with whole grains---oats, wheat germ, and whole wheat flour---and other nutritious ingredients like dried cherries, pecans, and eggs, they're an AOK addition to the cookie jar! Preheat the oven to 375ºF. Line two large baking sheets with aluminum foil and then lightly oil or coat with nonstick cooking spray; set aside. 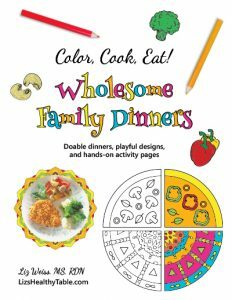 Whisk together the oats, pecans, all-purpose flour, whole wheat flour, wheat germ, baking powder, and salt in a large bowl. In a separate bowl, whisk together the eggs, brown sugar, oil, and vanilla until well combined. 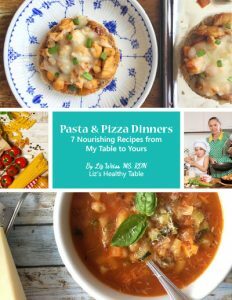 Pour the liquid ingredients over the dry ingredients, and stir until just moistened. Mix in the cherries and the chocolate chips. Working in batches, scoop the batter by rounded tablespoon and place on the prepared baking sheets. 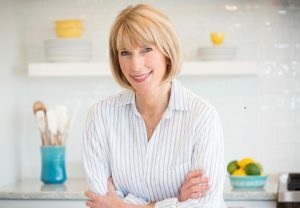 Wash your hands (it will be easier to work with the batter), and then flatten slightly with the heel of your hand, forming 2¼ to 2½-inch cookies. Leave about 1 inch between each cookie. Bake 12 to 14 minutes, until golden brown. Cool for 5 minutes on the baking sheet before transferring to a wire rack. Repeat with remaining batter. 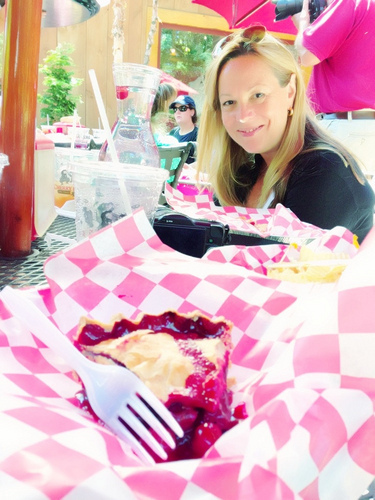 Indulging on cherry pie with my friend and fellow dietitian, Janet Helm at Cherry Republic in Glen Arbor, MI. Read about my trip to the tart cherry harvest.